Tim Reinbott and Alisha Moreland have combined forces to battle breast cancer through Alisha’s Pink Pumpkin Painting Party. The event has become a staple at the Bradford and South Farm Research Centers. This story also appears in our University of Missouri College of Agriculture, Food and Natural Resources’ Agricultural Research Center Magazine. Stop by your local Research Center to pick up a copy! You can view the magazine online by clicking here: Road to Discovery. It was in 2007 when Alisha Moreland’s manager at the Columbia Daily Tribune was diagnosed with breast cancer. Moreland, who was working as a graphic designer at the time, was good friends with her manager and the diagnosis was a devastating one. After a tough battle, Moreland’s friend did beat cancer – but it left Moreland with a thought. What if the cancer had been caught earlier? That thought has led to a passion to help women who can’t afford mammograms and to also raise awareness with highly-decorated pumpkins. 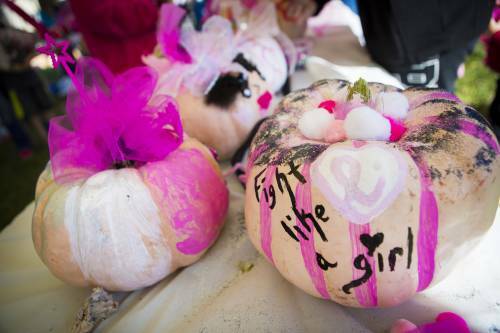 Through Alisha’s Pink Pumpkin Painting Party, Moreland raises funds and brings awareness to breast cancer. The funds go to the Ellis Fischel Cancer Center Mammography Fund. Reinbott has challenged the other MU Agricultural Research Centers to host similar events. Several … Expand ▸Reinbott has challenged the other MU Agricultural Research Centers to host similar events. Several of the Centers took Reinbott up on his challenge, either hosting their own events and raising funds or growing pink pumpkins. All of the funds continue to go to the Ellis Fischel Cancer Center. It was just a few years ago when Tim Reinbott found out about the parties. Moreland approached Reinbott looking for a partner for the pumpkins. Moreland had been self-funding the entirety of the parties, buying the pumpkins from a variety of sources. She knew Reinbott, who was the superintendent of the Bradford Research Center when they met, grew pumpkins for the various children’s events at the Center. Moreland was hoping Reinbott could help be a source of pumpkins for the parties. During the early discussions between Moreland and Reinbott, Moreland mentioned growing actual pink pumpkins. While Reinbott had grown pumpkins before, he had never ventured into the pink pumpkin business. “I had honestly never heard of these type of pumpkins,” Reinbott said. “I had been growing pumpkins for a few years, and I thought this would be a fun addition to the crop. Bradford hosted its first painting party in 2014, offering the pumpkins to everyone who had an interest in stopping by and painting one. Reinbott planted porcelain doll and Indian doll varieties. The event has become a staple at the Bradford Research Center over the years, even after Reinbott moved to the South Farm Research Center as the assistant director of the Agricultural Experiment Station. Andrew Biggs, current superintendent of Bradford, has continued to plant pumpkins and host parties. Reinbott has now added the party to the annual South Farm Showcase and has challenged the other MU Agricultural Research Centers to host similar events. Several of the Centers took Reinbott up on his challenge, either hosting their own events and raising funds or growing pink pumpkins. All of the funds continue to go to the Ellis Fischel Cancer Center. For more information about Alisha’s Pink Pumpkin Painting Party, visit their Facebook page at facebook.com/PinkPumpkinParty.